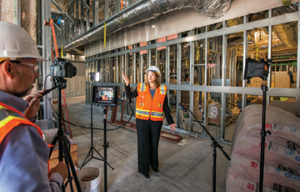 Above: NorthBay Healthcare Group President Aimee Brewer records a video blog during a tour of the three-story wing being built at NorthBay Medical Center. NorthBay Healthcare Group President Aimee Brewer has a unique perspective on the NorthBay Healthcare system, and she’s ready to share it with the world, via a video blog starting this September. “Did You Know” is a first-of-its-kind video venture for a healthcare system president. It will feature interviews with physicians, nurses, staff and patients. It can be found on NorthBay.org, on Facebook.com/NorthBayHealthcare, and on NorthBay’s Youtube channel. You can subscribe to receive alerts every time a new video blog is posted. Upcoming videos will include a tour of the three-story modernization project now under construction on the NorthBay Medical Center Campus in Fairfield. Aimee will also take you behind the scenes of the new Center for Orthopedics and Rehabilitation, and the new NorthBay Urgent Care Center in Vacaville.